It's important that you keep in mind the basic objective of what you're trying to do with a salmon fly when you present it to the river. You're trying to replicate the stream movements of a 'live' creature that pulses, waggles & darts in an attempt to trigger a predatory instinct from a salmon. 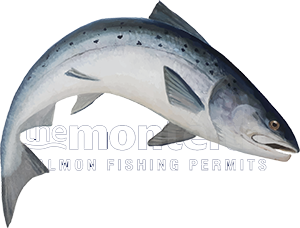 A boring lifeless swing may catch you the 'easy fish' but the swim style you should be trying to create should allow you to entice the oldest most educated salmon in the pool. With that in mind you need to swim your fly at the edge of the river to observe the natural movement of the fly before you even begin fishing with it. When the relevance of this obsession really hits home you'll not fish a fly that doesn't move well as you'll have witnessed the added attention salmon will give to a fly that has natural movement of its own. This is the starting point of the thought process that will ultimately turn you from a salmon fly fisher to a salmon hooking machine. The next train of thought is to work out where in the water column you think salmon are holding then adjust your fly line's sink tip to sink your fly accordingly. Of course a fresh run easily caught salmon that's still in a state of excitement from its arrival into fresh water will come 10ft or more to intercept a fly but with salmon that have been in the river a while you'll normally need to get your fly right onto their noses to achieve the desired reaction. Once you've made the adjustments for selecting a fly that moves correctly and is fishing through the pool at the correct depth it's then a case of making sure the speed of the fly is matching the water conditions. In fast water a high rod tip following an upstream mend will pace your fly correctly as will a square cast and downstream mend in a slow moving pool. There are so many differing permutations of what pace of fly will gain the best results that it often pays to experiment. My own thoughts on fly pace are to fish a slower steady paced salmon fly through the colder water of Spring but not too deep until the end of April when I'll sink the fly down a bit deeper. Up until mid April salmon are usually found holding in the upper areas of the water column where the warmer thermals are located. In the Summer I'll usually fish either a faster higher positioned fly in the shallower steams before going deep again for bottom holding fish through the milder river water of Summer. My Autumn tactics are the deepest of the entire season as most Autumn salmon will hold at the bottom of the pool and will have seen many flies so getting right down onto them is very important for one to cooperate. Introducing subtle nudges or added movement created by the rod tip as the fly fishes will also separate your salmon fly from the movement of others that they've seen. You want to create a salmon fly movement technique that encompasses all of the above and if you do you'll gain far more attention from salmon than a thoughtless fly fisher will ever achieve. If you're not already tuned into these points have a go and let the salmon advise you the next time you're out on the river.